Check out the new entertainment on offer at Club MAC! 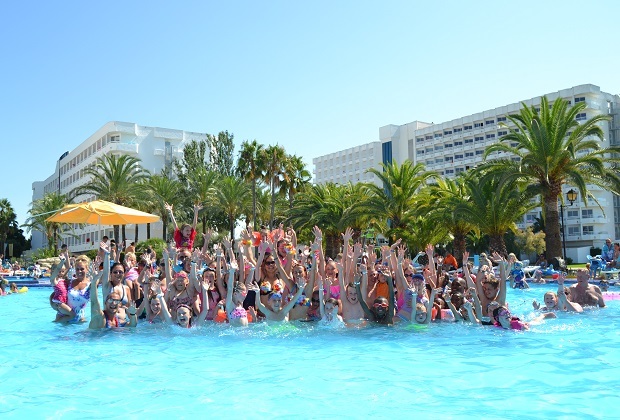 At Club MAC Alcudia, we’re all about putting the fun into your holiday. We have so much entertainment on site for all the family. So, whether you have teenagers, little ones or babies, there’s so much to do you’ll struggle to fit it all in! Finding plenty to do for everyone is our priority. We like to give lots of options so that family members can have time with each other, and time making new friends while doing exciting things. We’ve just launched our teenager specific programme of entertainment for 2017. From games on the beach to weekly dances, video games and much more, we have everything for every kind of teenager. It’s guaranteed to make the ideal family holiday. Check out the entertainment section on our main site for all of the information. Every week on Monday nights, we have exciting and fun pyjama parties for minis (children aged four to 10), and maxis (kids aged 11 and over). Our entertainment team will collect your kids at the Circus, when the mini disco has finished. All they need to do is wear their pyjamas and bring a pillow! The pyjama party takes place in the mini club, with lots of games, stories, fun and treats to be enjoyed. The team will bring the kids back to the Circus at approximately 22:30, when we’re sure they’ll be ready for bed. You’ll need to pre-book on the day at the guest house, and each party will be for 20 children. For those kids who don’t want to take part in the Princess for a Day activity, there’s now an alternative. In the morning, they can get scribbling with Art Attack in the mini club, and in the afternoon, they’ll get to meet and hang out with Macky! Our beloved mascot will be available at 16:00 in Jupiter square for photos, cuddles and fun. He’ll have sweets for his friends and information on the entertainments for the coming week. Adventurous kids will love our new zip line, which is available at either 10:30 or 11:30 every Wednesday morning. Set up between trees on the mini golf course, the zip line is free of charge and available for children between seven and 12. They just need to put their name down at the Guest house the day before and decide which time they’d prefer. On Wednesdays teenagers can become entertainers for a day and find out what it’s like to work in our friendly team at Club MAC. They get to come to meetings and take part in activities. On Thursdays, we have a Family Day. Everyone is invited to play in the pool and take part in a Family Masterchef competition where they can make a cake out of sweets. We also have Family Tiki Parties at the Saturno pool.